In the automotive world, few segments are more competitive than the midsize sedan class. With entries that cater to the family on the go and individuals who enjoy a spirited day-to-day commute, midsize sedan models check all the boxes. With the debut of the 2018 Mazda6, the class has become even more competitive. 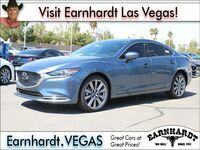 Armed with upgraded engine options, a revamped style and more luxury features, the 2018 Mazda6 in Las Vegas, NV promises to be a fan favorite when it arrives in the spring of 2018. When the 2018 Mazda6 arrives, it will be available in four distinct trim levels – Sport, Touring, Grand Touring and the luxury-infused Signature trim – that can be tailored to fit your lifestyle and specifications. An updated platform employs a Mazda KODO—Soul of Motion design that is illustrated by a new grille, LED headlights, a wide and athletic stance, a refined SKYACTIV®-Chassis and a more insulated cabin that eliminates road noise. With the addition of innovative technology, luxury amenities and power-packed engine options, the 2018 Mazda6 is the total package. What Are the 2018 Mazda6 Engine Specs and Features? Do you love an athletic and efficient drive? Are you looking for a midsize sedan that will turn heads when you get behind the wheel? 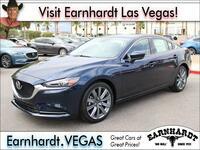 Look no further than the 2018 Mazda6 in Las Vegas, NV. 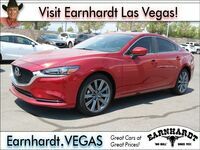 Expected to arrive at Earnhardt Mazda Las Vegas in the spring of 2018, the new and improved Mazda6 promises an athletic drive, a luxurious cabin, innovative technology, efficient fuel-economy ratings and an affordable price. New 2018 Mazda6 models will employ an upgraded 2.5-liter SKYACTIV®-G four-cylinder engine that is paired with a six-speed SKYACTIV®-Drive automatic transmission. The new standard engine will employ cylinder deactivation technology that will shut down the outside two cylinders at speeds between 25 mph and 50 mph in an effort to maximize fuel economy. G-Vectoring Control is a new standard asset that will improve handling and performance. Drivers who are drawn to behind-the-wheel thrills will love what the all-new SKYACTIV®-G 2.5T turbocharged four-cylinder engine will bring to the table. 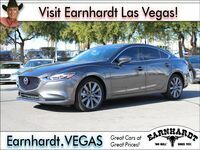 With this invigorating powertrain under the hood, the 2018 Mazda6 will make 250 horsepower and 310 pound-feet of torque – comparable to a 4.0-liter V-8 engine. Mated to a six-speed SKYACTIV®-Drive automatic transmission, the turbocharged Mazda6 promises to upgrade your daily commute. Inside the 2018 Mazda6 cabin, you will be greeted by a wealth of innovative technology features and luxury amenities. A quiet, well-insulated cabin is made even more impressive with premium materials that include Nappa leather, UltraSuede® NU trim and Sen wood accents for the top-of-the-line Signature grade. An eight-inch MAZDA CONNECT™ touchscreen interface with Bluetooth remains the central focus of a redesigned cabin. Additional highlights include a 360-degree monitor system, Mazda Radar Cruise Control with Stop & Go technology and an available Active Driving Display heads-up unit. 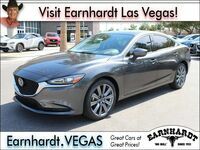 Interested in a 2018 Mazda6?